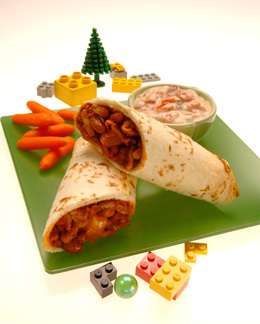 A thick chili con carne with cubes of melting cheese is enclosed in tortillas to form a burrito. See other variations to serve it in a bowl or on top of baked potatoes or cooked pasta. On cutting board stack 2 mushrooms slices one on top of the other; with sharp knife slice crosswise into narrow short strips; repeat with remaining mushrooms; set side. With sharp knife cut onion in half on cutting board, place flat side down and cut in both directions to coarsely chop. Add 1 tbsp (15 mL) oil to skillet and place on burner; turn to medium high heat. Add ground chicken and with large spoon stir while cooking (about 3 minutes) to break up into small pieces. Stir in onion and mushrooms; crush garlic into pan and continue cooking and stirring until lightly browned, about 5 minutes. Stir in beans with sauce, tomato sauce,1 tbsp(15 mL) chili powder, cumin and hot red pepper flakes if desired. Lower heat to medium-low and cook stirring occasionally 8-10 minutes or until very thick. Turn off burner and move skillet to a cold burner. Taste and add more chili powder if desired. Preheat oven to 400º (220ºC). On cutting board cut cheese into 30 (½”/1cm) cubes. Lay tortillas on counter; spoon ½ cup (125 mL) filling on to the bottom third of each tortilla, leaving a 1”(2.5 cm) border; arrange 5 cubes of cheese on top each one. Fold the bottom of tortilla over filling and fold the sides in to seal filling. Roll up tightly from bottom to enclose completely. Using pastry brush lightly coat baking pan with 1 tsp (5 mL) oil and place rolled tortillas, seam side down on the pan. Brush remaining oil on tops and sides of filled tortillas. Place baking pan in middle of oven; bake for about 15 minutes or until lightly browned on the bottom. If desired turn on broiler for 2-3 minutes to crisp and brown the tops. Cool 4-5 minutes; mix sour cream and salsa in small serving dish. Using serrated knife cut tortilla rolls in half diagonally. Serve with dipping sauce. Variations: To serve chili in a bowl reduce cooking in the skillet to 4-5 minutes or until just slightly thickened. This also makes a great topping for baked potatoes or serve it over cooked pasta and garnish with grated cheese and dipping sauce.